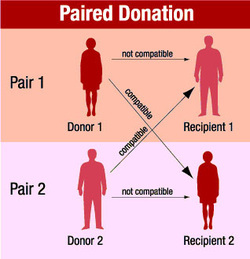 It takes into consideration the blood type and major histocompatibility complex (HLA sistem). After the transplant, the recipient must receive immunosuppressive drugs to prevent that the organ is recognized as foreign and produce a rejection. If the compatible organ couldn't be found, we take another organ (making use of plasmapheresis, elimination from the blood of antibodies that cause rejection) because it is preferable that the receiver will reject the organ to die.